Hi, my name is Lindsey Metrus, and I'm a sheet mask addict. There's something so refreshing about putting on a slimy, gooey face-shaped sheet, letting it sit for half a television show, and peeling it off to reveal dewy, glowing skin. It's instant gratification, and the healing evening ritual soothes and calms me every time. I can't get enough of them. 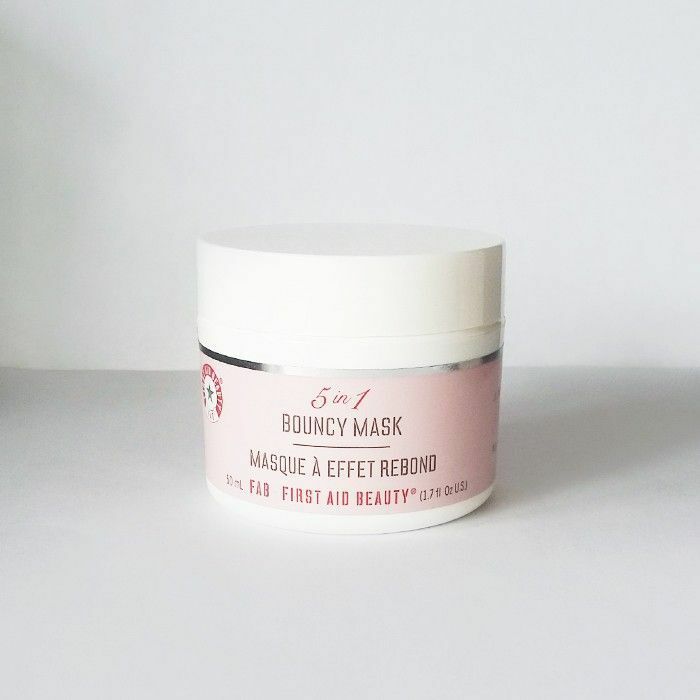 So when I got my hands on First Aid Beauty's New 5 in 1 Bouncy Mask ($38), you can imagine my skepticism. For starters, it wasn't in sheet form, so I was already a bit averse to it, but honestly, that was really all that stood between me and the mask, so I figured what the heck? The jar says that it helps to "nourish, calm, firm, plump, and refine." Okay, I'm interested. I removed the lid to find a pale yellow goo that smelled strongly of cucumber. The consistency was intriguing, so I lightly tapped my finger off the solution and was surprised by a literal "bouncy" effect. My finger rebounded right off the gel, almost like the homemade Silly Putty you'd make in grade school. And just like Silly Putty, it turns into liquid form when you dip your fingers in and lift it out of the jar. I slathered it on my skin excitedly and let it do its thing. Within mere seconds, a cool, tingly feeling overcame my skin, and I felt seriously refreshed. As it dried, there was no sticky or drying feeling like some masks give off, and after 10 minutes was up, I rinsed it off, looked up in the mirror, and almost literally glowed. It was bliss. What's genius about this mask is that the Silly Putty texture isn't for show—it actually hardens back up once it's on the skin to tighten and firm the skin, almost like an instant face-lift. Pretty cool, right? Hydrating, soothing, and easy to use—this mask may put my sheet masks on a hiatus… but not just yet. What's your favorite type of mask? Tell us below!